PSWHEY™ by PROSUPPS® is the premium choice for meeting your daily protein needs. PSWHEY™ contains 24g of 100% pure, premium whey protein per serving, so that you can focus more on your next workout or next task, instead of worrying about the quality of your protein. 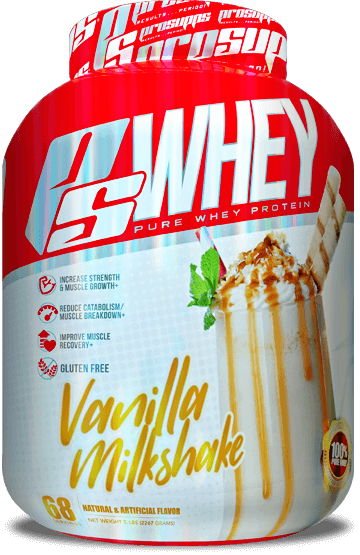 PSWHEY™ harnesses the power of both whey protein isolate and whey protein concentrate. This unique combination offers unique ‘whole food’ benefits while driving protein synthesis to maximize your lean muscle growth and repair. * And because we know that premium taste is vitally important, we have worked tirelessly to present PSWHEY™ in gourmet flavors that will satisfy even the most discerning of taste buds. This is the measure of protein quality and the efficiency of how well the human body utilizes protein. When this test was created, the maximum score possible was 100 – however, the test was created utilizing egg protein. At the time, egg protein was considered the best whole food protein source. Scientific research leading to the formulation of advanced, concentrated proteins such as PSWHEY™ make it possible to exceed this score. One of the primary reasons for using a protein such as PSWHEY™ is to promote lean muscle growth and maintenance. * The PER (Protein Efficiency Ratio) is a number that measures the muscle weight gain of an individual, when taking protein intake and overall diet into account. Net protein utilization is the overall determination of how many amino acids are eventually converted into whole proteins and utilized in the body. Simply put, the proof is in the numbers – you can rest assured PSWHEY™ delivers protein that you will utilize.